This weekend’s Barron’s introduced a new measure of “fear” in the stock market developed by a team from Credit Suisse’s equity-derivatives trading and strategy desk. It is called the Credit Suisse Fear Barometer (CSFB). A clumsy name for what seems to be a clumsy indicator. To break it down, they are looking at zero cost collars and measuring the skew between the upside target and the downside protection. So for example, in October 2008 when the S&P 500 was plummeting and the CBOE volatility index was screaming higher (reaching a high of 89%) the Credit Suisse Fear Barometer was around 10%. This implies that, back then, if you were long the index you could have put on a costless collar at +/-10%. Put into context, this means that there was almost zero fear in the market. Huh? Does that make sense to anyone? All you had to do was have a pulse and watch the market to know it was one of the most turbulent chapters in market sentiment. The dynamic duo at Credit Suisse have backtested their indicator all the way to 1998 and shown that it has a small range (at least compared to the VIX). The minimum was 10% (as mentioned above) in October 2008 and the maximum was March 2007 when it reached 30%. But March 2007 was a market top (of sorts) in the S&P 500. Again, it makes no sense to say that this was a “fearful” time in the market. 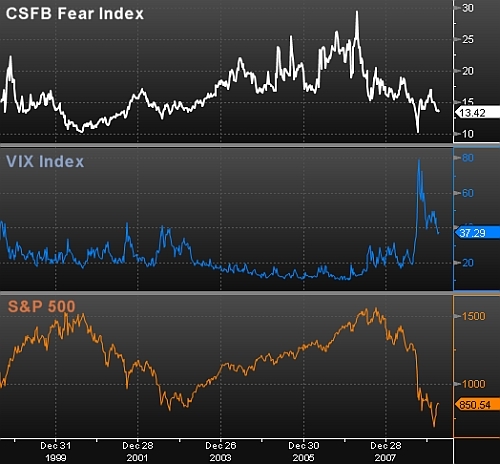 Source: Is The New CSFB Fear Index A Bust? Now I’ll be the first to admit that the VIX is not an ideal sentiment indicator but does the CSFB make any sense as an indicator? Do you see any relationship between either the VIX or the S&P 500 and the CSFB? Useless sentiment indicators abound out there and they keep being calculated and disseminated like zombies. Looks to me like the CSFB is a prime candidate for the round filing cabinet - even before it arrived! - which is some kind of record. But maybe I’m being too hasty, we’ll give it a few months to see what it says in real time, based on historical performance the bar is set low indeed. Get a FREE subscription to Traders magazine. Take advantage of this offer right now because it will expire very soon. Traders magazine informs the professional buy side and sell side trader about the evolving market structures. It covers trends on market making, globalization, block trading, technology, electronic trading, inter-dealer trading, soft dollars, electronic communications networks and all technology that impacts the trading community. Thanks for this. Any idea where I can get the data for this new fear indicator?…without having to pay for it. Here’s a CS report introducing it. You can also try contacting them directly for info (CS Equity Derivatives Desk). The CSFB is actually an optimism index (Calls vs Puts). You have to invert it to get a “fear” index, comparing Puts to Calls instead. Look at it upside down, and you’ll see what I mean.